NEFHMA Founder, Rene U. Pulido, M.D. Rene U. Pulido, M.D., of Emed Primary Care is a Mayo-Clinic trained physician who runs Emed Primary Care & Walk-In Clinic, a successful primary care and walk-in clinic established since August 2010. Dr. Pulido is passionate about giving back to the Hispanic community and has endeavored in a multitude of avenues which has led to the founding of NEFHMA. 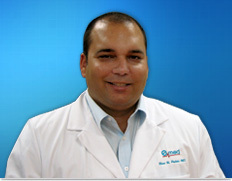 Dr. Pulido is a lifetime Jacksonville native whose family located to Jacksonville in the 1950’s from Cuba. After attending Jacksonville’s Assumption Grade School and playing football for Bishop Kenny H.S., Dr. Pulido followed in the footsteps of his uncles Jesus Pulido, MD and Alex Pulido, MD, and his two brothers, Mario and Danny by attending medical school and becoming the successful doctor he is today. After finishing the Mayo program, Dr. Pulido worked with Solantic Baptist Urgent Care honing his skills in urgent care. Dr. Pulido values the teamwork approach coupled with the latest advancements in technology in order to provide the best patient care. Dr. Pulido’s continued affiliation with the Hospital Corporation of America’s family of physicians, has allowed him to provide complete and integrated health care to all of his patients. Now, coupled with his educational and practical experiences in medicine, it is Dr. Pulido’s goal to bring his talents back to the community and help the people who have given him so much.